In summertime, the underwater trail is an aquatic ramble in flippers, mask and snorkel, to explore the rich variety of the marine world. At the Domaine du Rayol, summer brings periods of drought and very high temperatures; this is a period of rest for the vegetation. The scents of the maquis and the sound of the cicadas are a real change of scene for visitors… So it’s a good time to put your head underwater and explore the 11th garden on the sea bed. In peace and quiet and in complete safety, come and explore the underwater flora and fauna in the Baie du Figuier. 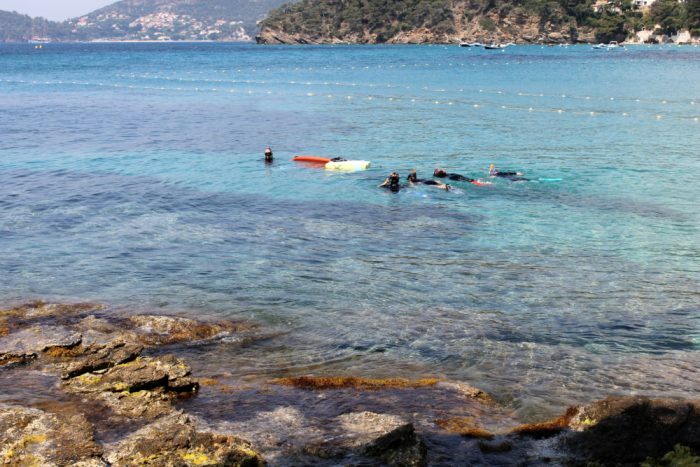 Starting from the beach, you will be led by one of the Domaine du Rayol’s qualified guides; prepare to be amazed by the treasures to be found in the shallows. You may come across mother-of-pearl, Mediterranean rainbow wrasse, starfish, sea bass, wrasse, sea bream and shoals of dreamfish in the Neptune grass beds; flatfish and sea cucumbers on the sandy beds; white sea bream, bass and barracuda in the deeper waters; and anemones, octopuses, pomfrets, etc. in crevices on the rocky sea bed. Starting from the beach, you will be led by one of the Domaine du Rayol’s guides. All equipment (wetsuit, flippers, mask and snorkel) is provided. Bring a swimsuit for the activity and suitable clothing for the tour of the gardens. Basic level, beginners welcome, suitable for all the family from age 8. The only requirement is being able to swim. Unaccompanied minors must have a letter from their parents giving them permission to take part in this activity. Children must however be accompanied by an adult in the Gardens.